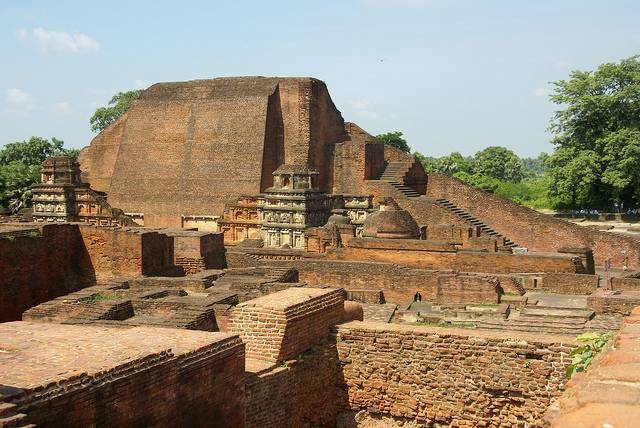 Nalanda city is an ancient center for learning, which is situated 88 km from the southeastern end of Patna. The red brick structure covers over 14 hectares of land. The world renowned and ancient University of Nalanda was established during the rule of a king called Śakrāditya, who belonged to the Gupta Dynasty. Nalanda is marked by Buddhist influence. The university is believed to be a masterpiece, and is marked by a lofty wall and one gate. Nalanda had eight separate compounds and 10 temples, beside several different meditation halls and study rooms. The grounds of the university are covered with lakes and parks. The library was situated in an exceedingly 9-storied building wherever meticulous copies of texts were made. The university attracted pupils and students from countries like Japan, China, Tibet, Indonesia, Persia and Turkey.